All three of the ‘Clem Heads’ so far. This blue enamel is like butter to work with, One Shot and Rustoleum <3 ! This is first of the seven heads, to be mount on reclaimed fence board… stay tuned for more. 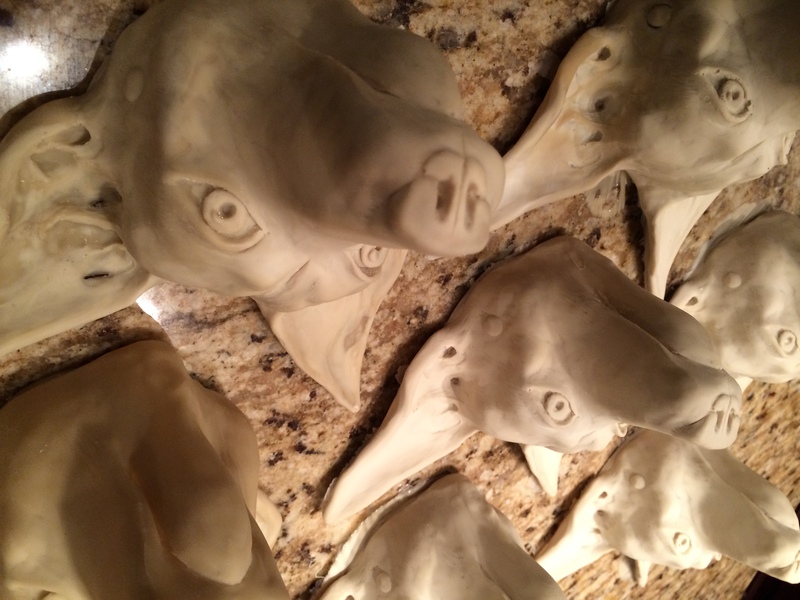 Working on new Dog Head, update. I am very happy with the silicone mold so far, I have been able to make seven heads. Next up… painting. A closed mold is easier to spin around, learned that the hard/messy way. I wrapped a piece of cling wrap around a scrap of cardboard, silicone and cling wrap make a decent seal. Yes that is “pink lacy” elastic, it’s what I had on hand. I have a big roll of it, don’t ask. Now for some trimming and sanding, then Paint! super excited!!!! With the outer shell done (plaster around pink silicone) I made the first casting. 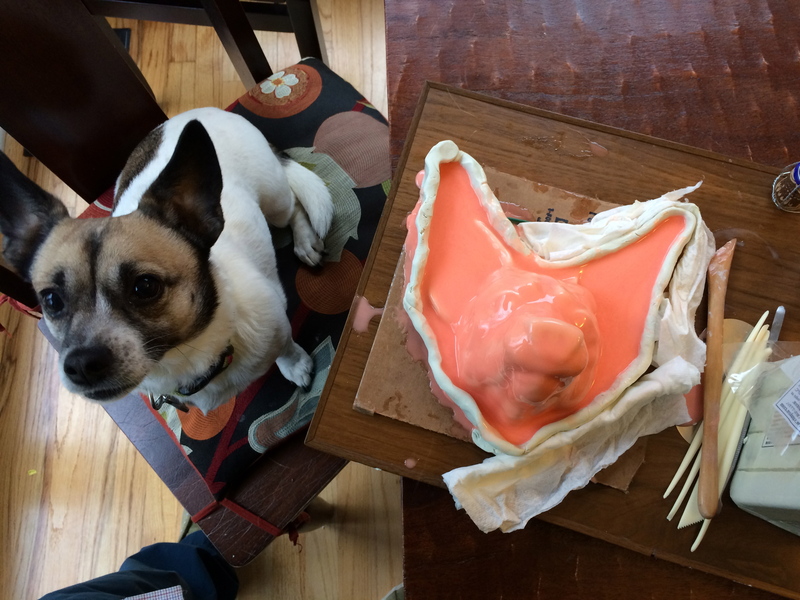 The gary head is the plastic casting (copy), the white one is the original sculpted (modeling clay) head, and the pink is the silicone negative. This is my first pour, I need to practice, a few thin spots and air bubbles. Clem was happy with the likeness. A little vanilla sky, Clem style. Starting the mold (mould) from the sculpture. Finished the left eye and nose, then started the mould process. I was nervous at first, I always thought that the original sculpture would be trash if you didn’t make the mould just right (that’s for plaster moulds), but after the first layer was dry I was hooked. I think (cross fingers) that this will be a good first test and I can then start scaling up. I will let it cure overnight and apply another coat of smooth-on 5050 in the morning. So far easy to work with and i like the pink on white I can see the high/strong and low/weak points. Clem is waiting for the first mold pour before she approves anything, Clem is on the left. Third pour now with registration points, and dams to fill weak spots. The ‘Clem Head’ is almost ready, I used scrap clay to make terraces around the eyes and nose areas (lots of detail low thickness). Registration pieces were cut from bits of foam insulation, but i will be using left over silicons bits in the future, the foam ripped holes and have escaped. Mother mold made out of plaster, it’s a simple two part mold, next time I’ll make it lighter and maybe more sections. I didn’t put too much (none) thought into the back. Very excited about this part. After 4 days I wanted to see how the original sculpture would fare. The original came out trouble free. The original is made out of Plastilina clay and popped out without the use of any demoulding spray. Starting the casting process mother mold together with the silicone mold, and the an after thought backplate. The backplate, cork and elastic… will it work? I am so happy at this point. Sculpture (pink) original (white) and first cast (grey). It is late at night but i press on and make 7 castings. Clem Heads are ready to paint. The next morning Clem joins me and checks out the work, she even poses so i can do a comparison, thanks Clem. I have a lot of work to do and can’t wait to get back to it. I have to finish the pieces for the May, Hive Gallery show first, and then it’s back to giant dog heads. Below is the incomplete Giant Dog head with coins for scale. Working on new Dog Head. 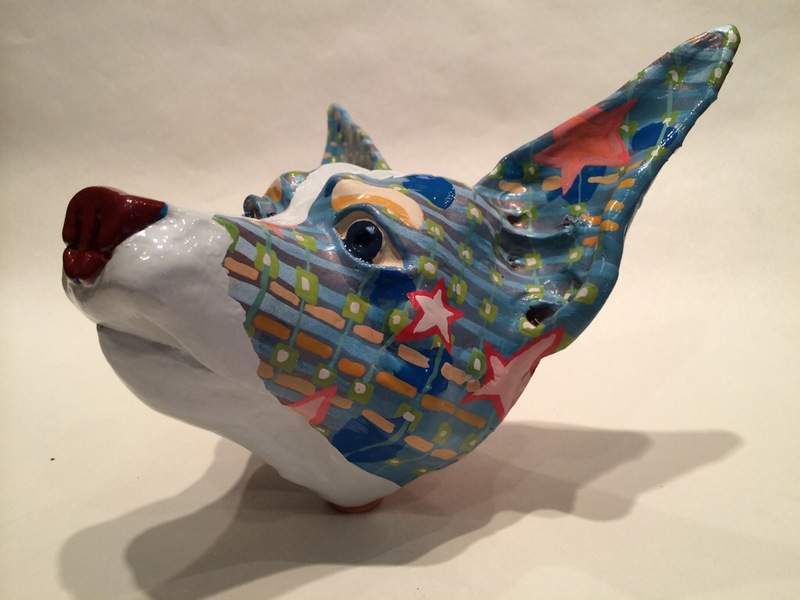 A new Plastalina dog head sculpture. 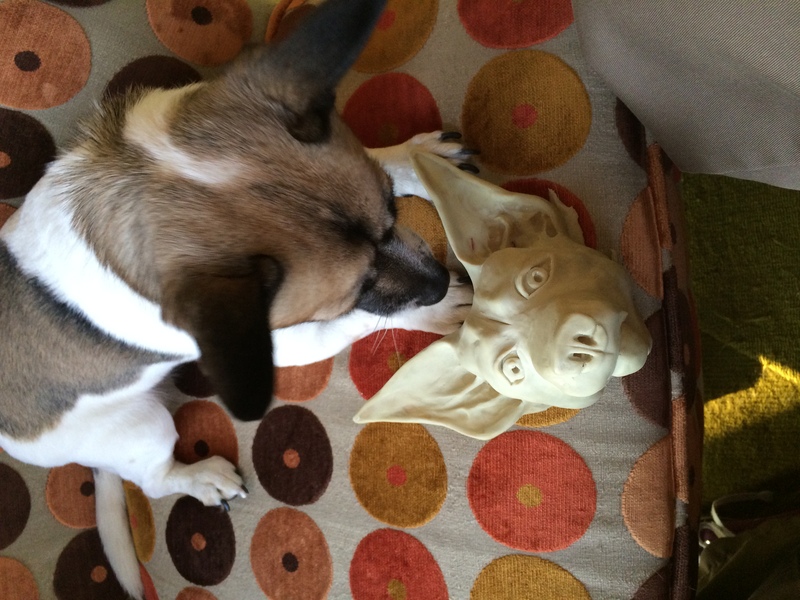 I’m making a door knocker based on my smallest dog “Clementine”. She will love it, the door bell makes her crazy. A few more hours and then, I will need to mould it. Wish me luck.